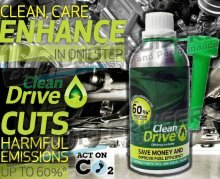 Clean drive boosts the performance of your vehicle or fleet and reduces costs and harmful emissions in one. Flush out gums and resins in the fuel system and carbon and similar deposits from the oxygen sensor/lambda probe and the Diesel Particulate Filter (DPF). Cut harmful engine emissions by up to 60%. Designed to be used in hybrid engines as well as diesel and petrol engines. Save money on fuel and engine wear and maintenance costs by up to 15%. Use it only every 3 months because it is not an additive. Cut your overall vehicle maintenance costs. Clean the EGR valves, Inlet valves and injectors. The clever science behind clean drive makes it simple to drive smarter. Clean Drive could cut the costs of running and caring for your car by up to 20%. It has also been shown to make it greener to run your petrol or diesel car by cutting harmful engine emissions by up to 60%. Clean Drive cleans, cares and improves the condition of your engine in just one step. The fuel saving performance has been proven in controlled laboratory tests by the University of Leicester. Clean Drive has been shown to reduce the vehicle engine emissions in MOT tests. In diesel engines, Clean Drive cleans the fuel pump, the connecting pipeline, the common rail, and the injectors. In petrol engines, Clean Drive cleans the fuel pump, the connecting pipeline, and the injectors. Clean Drive de-clogs the catalytic converter and the diesel particulate filter. Clean Drive lubricates the engine wall.